The champs remained undefeated, but had to use every second to do so. 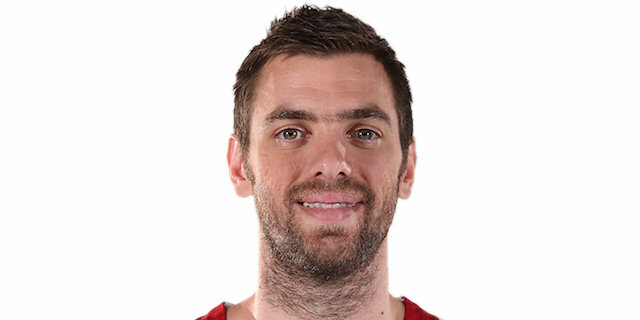 Vangelos Mantazris’s three-pointer at the buzzer proved to be the fifth – and final – lead change in the closing minute as Olympiacos Piraeus edged Stelmet Zielona Gora 79-77 in an instant classic at Peace and Friendship Stadium. The game seemed to be a historic win for the Polish champs after Christian Eyenga’s basket with 2.4 seconds remaining, but Mantzaris made sure his team’s fans went home happy. The Reds improved to 5-0 in Group C. Zielona Gora – despite a fantastic effort – slipped to 1-4. The hosts made 5 three without a miss in the last few minutes to come back from 8 down. 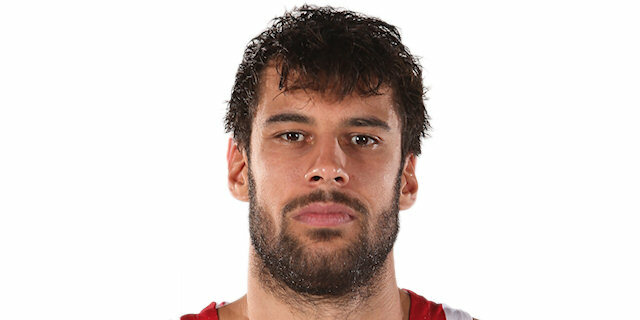 Georgios Printezis, who made 2 of them, finished with 21 points and 7 rebounds. 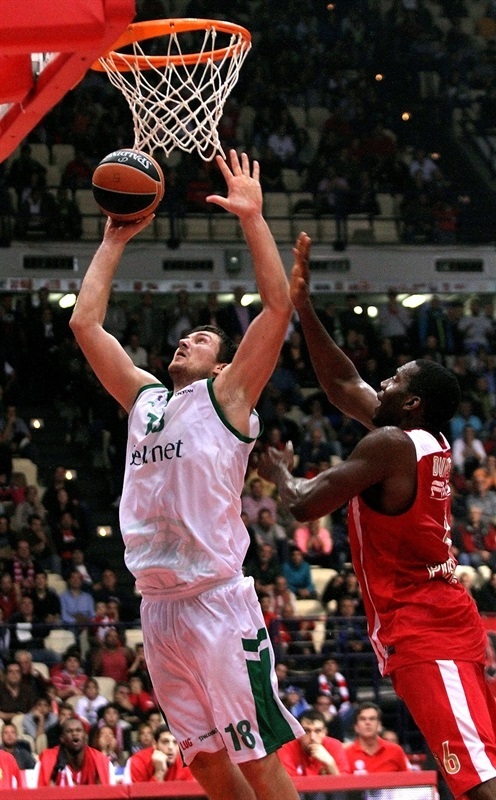 Euroleague MVP Vassilis Spanoulis tallied 18 points and 9 assists and Matt Lojeski netted 13 for the winners. Vladimir Dragicevic paced the Polish champs with 18 points and 12 rebounds, Aaron Cel scored 15 and Christian Eyenga 13 in defeat. Printezis broke the ice with a free throw a minute into the game. Dragicevic dropped in a nifty pass to Eyenga for the visitors’ first points. Bryant Dunston was a force on defense with 3 blocks on Dragicevic on three separate possessions. The Stelmet big man finally scored, but Dunston matched him at the other end. A Lukasz Koszarek jumper put the visitors in front 5-8. Koszarek lobbed a brilliant all-oop pass the Eyenga, who finished in style with a two-handed jam. Koszarek penetrated for a reverse layup and a 5-point lead. Acie Law penetrated for his first points, but Craig Brackins stepped outside and padded the Zielona Gora lead. Law threw in a runner in the paint, but the momentum remained with the Polish champs. Kamil Chanas followed up his own miss and drew a foul for the ultimate Fantasy Challenge play. Dragicevic added a tip-in before Koszarek fed Dragicevic for a jumper on the buzzer that made it 11-22 through 10 minutes. Lojeski got some of the crowd involved with a mid-range jumper. Dunston rejected Dragicevic again, but the Zielona Gora big man was first to the ball and scored anyway. Law fed Printezis for a pair of baskets as the hosts closed the gap to 7. Erving Walker’s runner kept the visitors in control, 17-26. Aaron Cel heated up and matched a Brent Petway tip in with a hook and countered Stratos Perperoglou’s triple with one of his own. A pull-up baseline jumper by Walker made it 24-33 midway through the quarter. Perperoglou connected from downtown and a minute later Lojeski did the same as the gap started to shrink. A fearless Cel knocked in his second triple for the visitors and Walker drove and flicked in a shot off the glass. 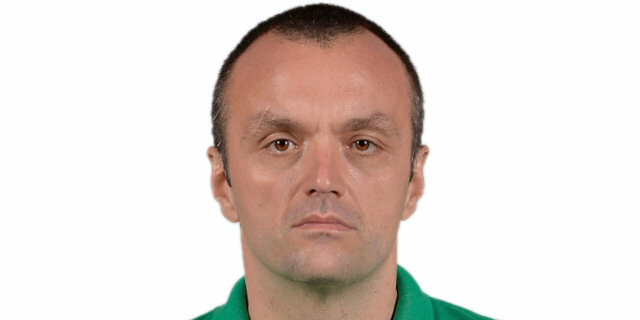 Dragicevic restored a double-digit edge at 29-40. 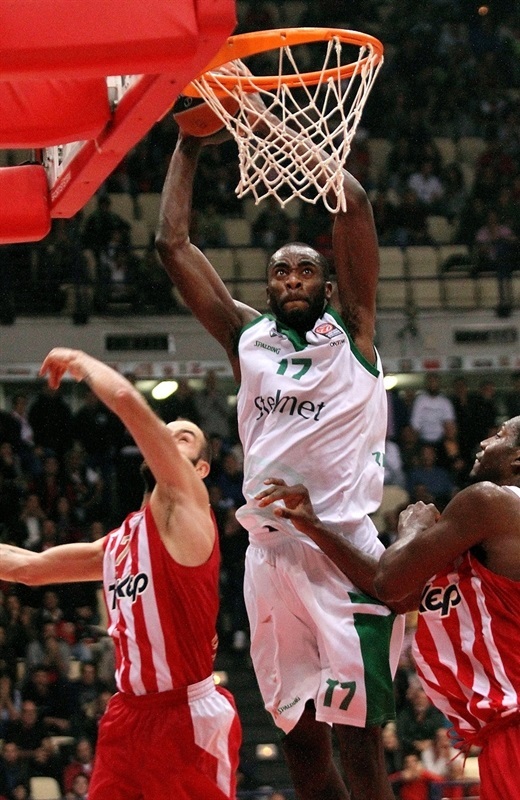 Dunston took a pass from Spanoulis and scored at the basket. Eyenga’s efforts on the offensive glass went unrewarded. Spanoulis scored his first points of the game from the line, but Cel banked a shot it at the other end to put his team in front 33-42 at the break. Dragicevic and Printezis traded baskets to open the second half. Spanoulis drove for his first basket of the game, but Koszarek matched him. It appeared the momentum was turning the Reds’ way after a Lojeski three made it 40-48, but Brackins boosted Zielona Gora at the other end. Spanoulis free throws brought his side within 44-50 midway through the quarter. After he set Printezis up, a Spanoulis jumper made it a 4-point game and Zielona Gora rushed to take a timeout. Koszarek found Dragicevic on the ensuing play, but Spanoulis drove through the Zielona Gora defense. Lojeski made it a 3-point game with his third triple of the night. Marcin Sroka countered with a three and Dunston failed to convert an alley-oop layup. Cel scored again before a Dragicevic basket at the buzzer put the visitors up 55-63. Fourth quarter: Five lead changes in the closing minute! Dunston sank a short jumper, which proved to be the only points in the first two minutes of the quarter. Eyenga recovered his own blocked shot to put the lead back at 8. The scoreboard flashed 57-65 at the TV timeout with just under five minutes remaining. Printezis came up empty after a trip to the charity stripe, but the hosts’ defense kept them in it and Printezis made amends with a three-pointer. Vangelos Mantzaris further shrunk the deficit from the line to 62-65 with three minutes remaining. Eyenga showed that his team wasn’t going away with a wicked two-handed slam and after Printezis scored inside, Dragicevic scored on the offensive glass, However Spanoulis fired up the crowd with a clutch three to make it 67-69 with two minutes to go. 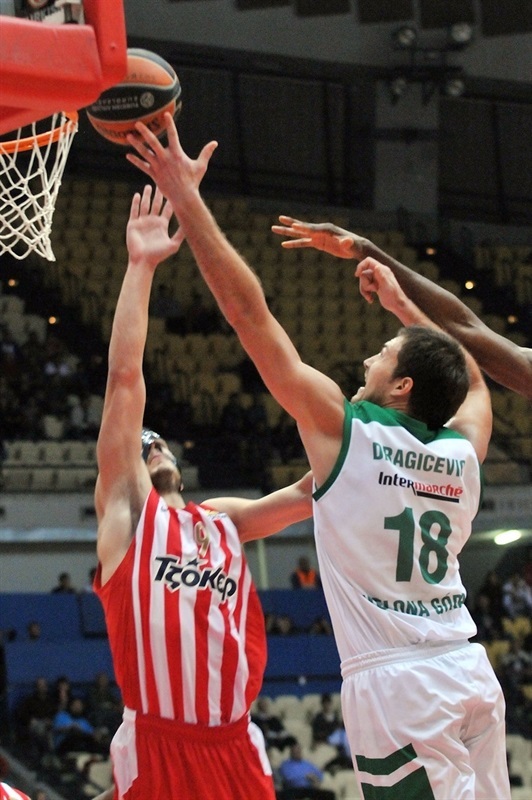 Walker drove for a tough layup, but Printezis continued the Olympiacos comeback with another triple. Eyenga split free throws for a 70-72 edge with a minute to go. Spanoulis completed the comeback with a classic crossover dribble and pull-up three for the Reds’ first lead since the opening minute. Mantzaris split free throws with 15.9 seconds remaining. Koszarek inbounded the ball to Cel, who nailed a three in the corner with 12.9 seconds to go for a 74-75 lead. The drama never died as Spanoulis slalomed for a layin with 7.3 second showing and Zielona Gora counterattacked, which saw Eyenga’s runner drop in with 2.4 seconds left. But there was just enough time for Olympiacos to get off a final shot: Mantzaris connected at the buzzer to keep the Reds undefeated. "It was a game with so many changes and very strong feelings. Too painful for the players and the coaches, but amazing for the fans. We have positive and negative points from this match and we have to study both of them. Although we were behind from the very first moment, we didn’t surrender and we kept fighting till the last moment, proving the big character of the team. 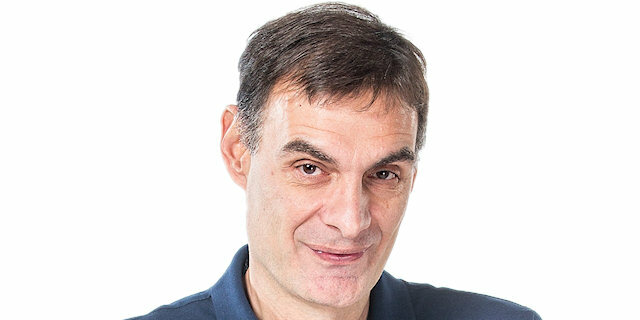 On the other side we had a wrong approach to the game, especially in the offense against their zone defense, because we had too many three-point shots and we also allowed them to grab many offensive boards. We missed the whole first half and then it was tough to come back and win. It is not fair to complain after a victory. You have to respect your success and not underrate it. We finished with a perfect 5-0 in the first part of the regular season, but there is no easy game in this level. All the teams want to beat the reigning Euroleague champions here and if we allow them to keep their hopes, it can happen sometime. It is impossible to remain perfect till the end of the competition. Maybe we are… tired of winning and you probably understand the meaning of my expression. I don’t agree with the impression that we underestimated Zielona Gora. You can ask my players what we discussed before the game about them." 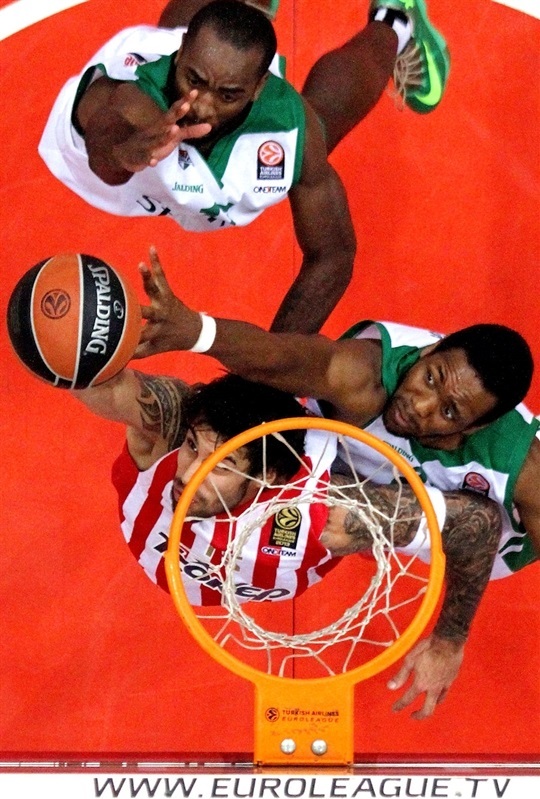 "It was an authentic Euroleague game , which we deserved to win and it is really tough to accept that we didn’t. However I am very happy and proud of an effort which came to maximum and the way that all my players tried to win. Any team that wins a game deserves it, but from the other side I think that we played a great game and showed big character and potential. There are some details which decided the result in the last seconds, but now it‘s over. I think that Olympiacos underestimated my team and they didn’t have the proper rhythm, but they weren’t punished for that. At the beginning of the season, everybody considered Zielona Gora as the worst team here, but we worked hard to get the respect and change this general opinion." "This is the first time that I bagged a buzzer beater like that and I am very happy because it was a winning three-point shot. In such a situation you haven’t time to think about the whole thing. You get the ball and just hit it. The people like games like that, but we don’t. It comes in a business as usual situation for Olympiacos to win at the end, but sometime we will lose a game like that and it will be painful. It is impossible to win every time with a big shot at the buzzer. Today we allowed them to play their game and then it was hard to come back. Fortunately our defense was better in the second half and since we played a more physical game, we managed to cut the deficit and get the victory." "Games like this are the real advertising for basketball, but are too risky for us. It was proved once again that there are no easy games in the Euroleague and this is something we have to take into account. Zielona Gora came here to play its game and they had nothing to lose. We are 5-0 right now and this makes us safe and happy, but there are still several parts of our game that we have to improve."